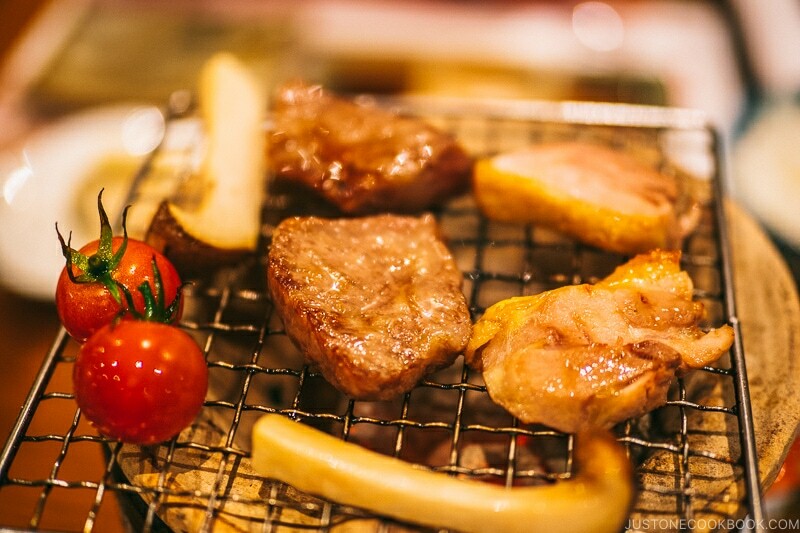 There are many things to do in Nara besides visiting its many temples and shrine. 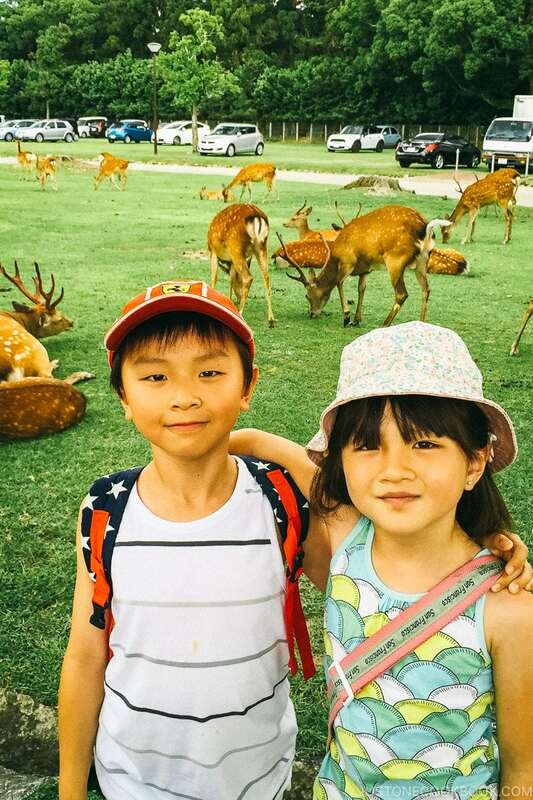 Try eating kakinoha-zushi in Naramachi, feeding deer at Nara Park, or visiting Nara National Museum. Nara is known for its temples and shrine, there is the renowned giant bronze Buddha in Todaiji and the vermillion columns of Kasuga Taisha. However, don’t miss other things to do in Nara and only visit the temples. 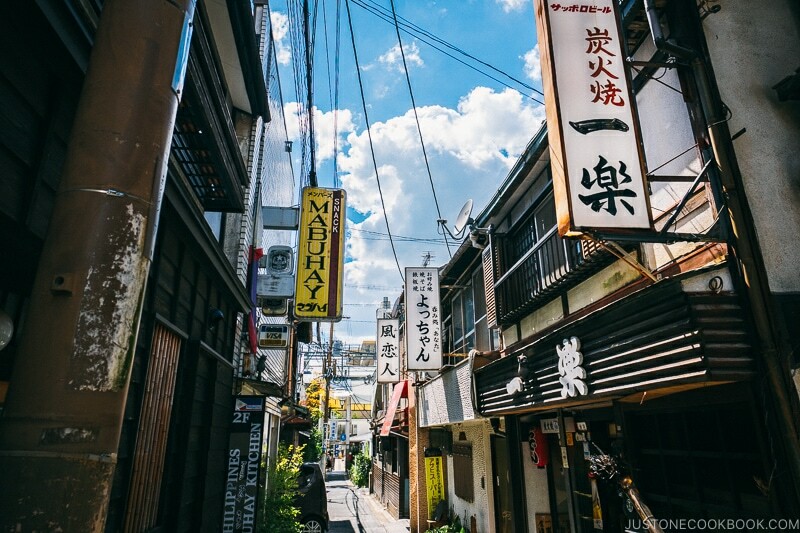 Come join us as we show you how to get to Nara, places we’ve stayed, delicious food we ate, and browse through the old street of Naramachi. 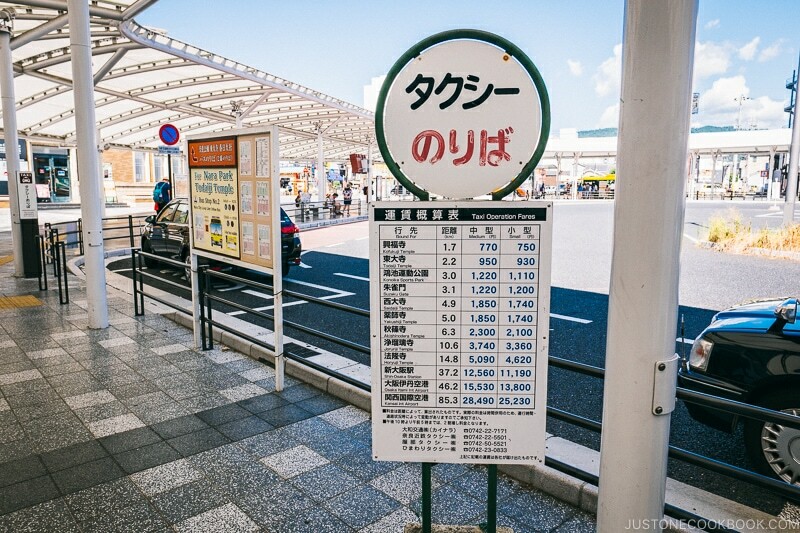 For the majority of foreign visitors, you will arrive Nara via Kyoto if you take the Shinkansen bullet train. There are a few trains you can take to Nara from Kyoto but the most cost-effective and fastest way is on the JR Miyakoji line (710 yen). 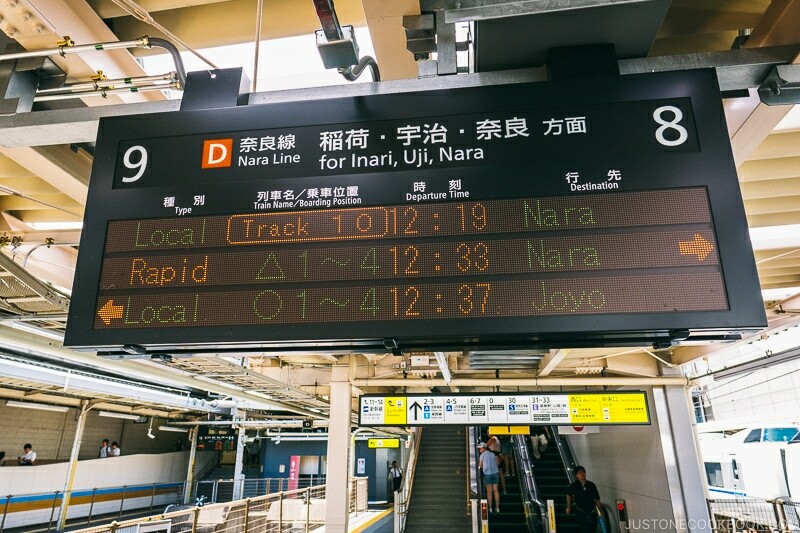 You can also take the Kintetsu-Limited Express to Nara but it’s slightly more expensive and you arrive at the Kintetsu-Nara Station instead of Nara Station (13 min walk away). 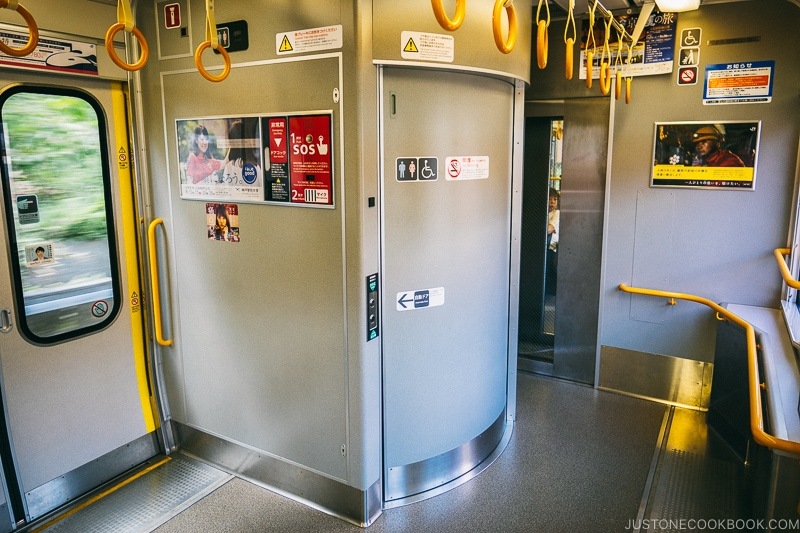 The Miyakoji Rapid Service train is spacious with large toilet facility and the seating is on a first come first serve basis. 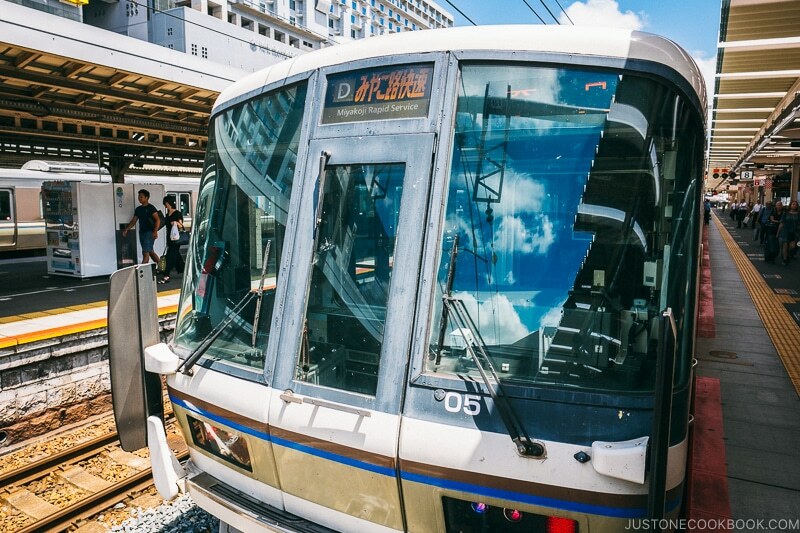 Although it’s a rapid service train, it will make seven stops along the way including at Uji. 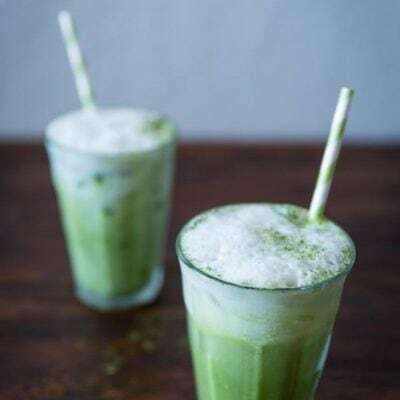 Uji is famous for its matcha. 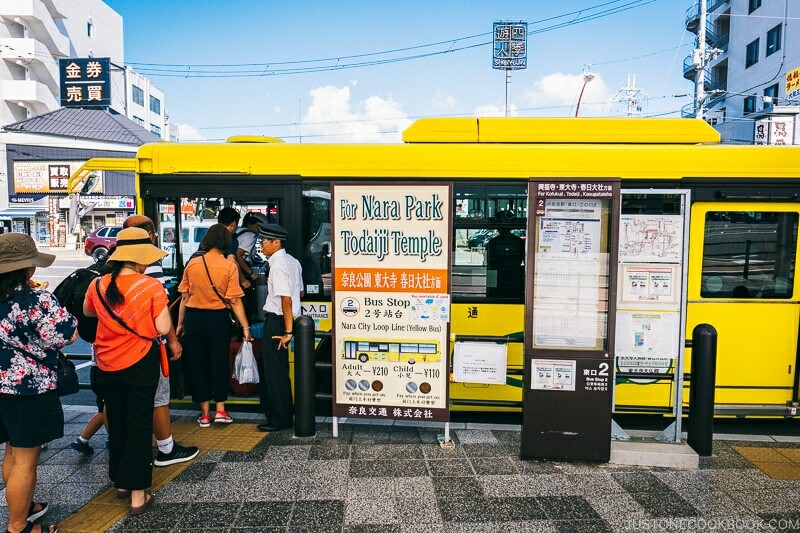 You can download the Nara City Main Route Map for bus routes but it’s fairly easy to get around the city and the main attractions. 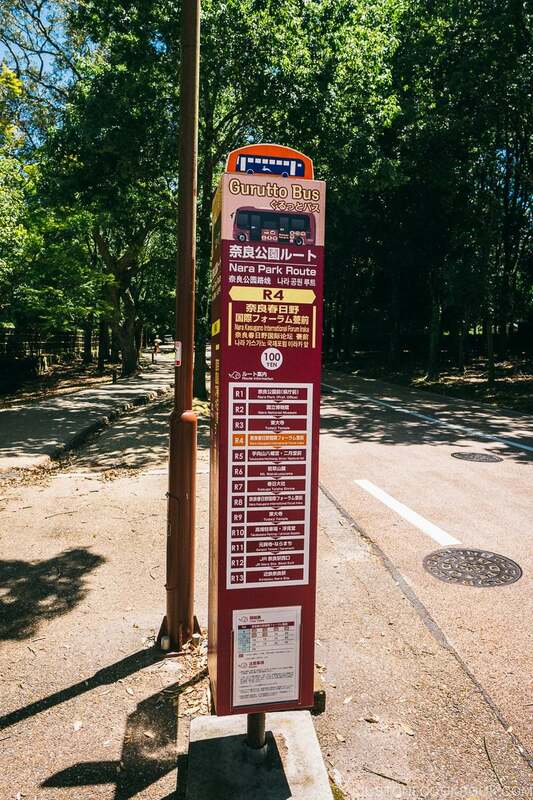 Bus 1 and 2 are loop bus that will take you to Todaiji, Nara Park, Kasuga Taisha, Kofukuji, Nara National Museum, Naramachi, and Gangoji Temple. Bus 70, 72, and 97 will take you to the west side of the city including Toshodaiji Temple and Yakushiji Temple. 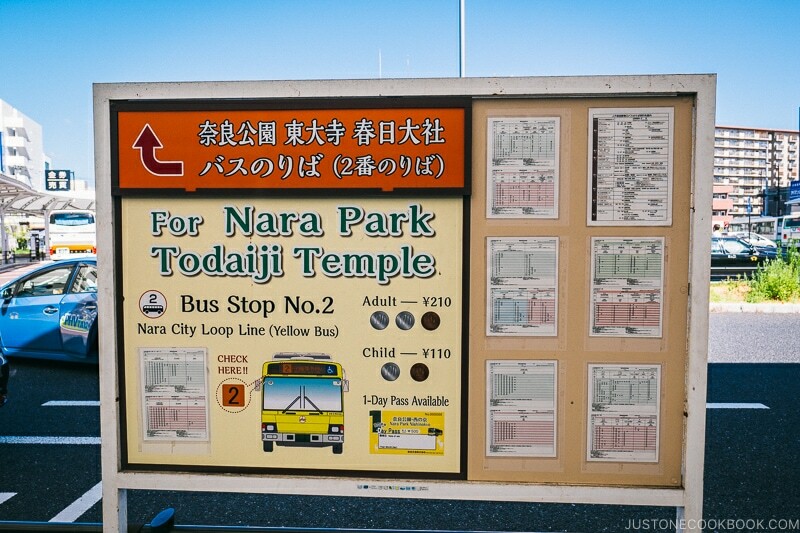 Only bus 97 will reach Horyuji Temple and takes about 1 hour. 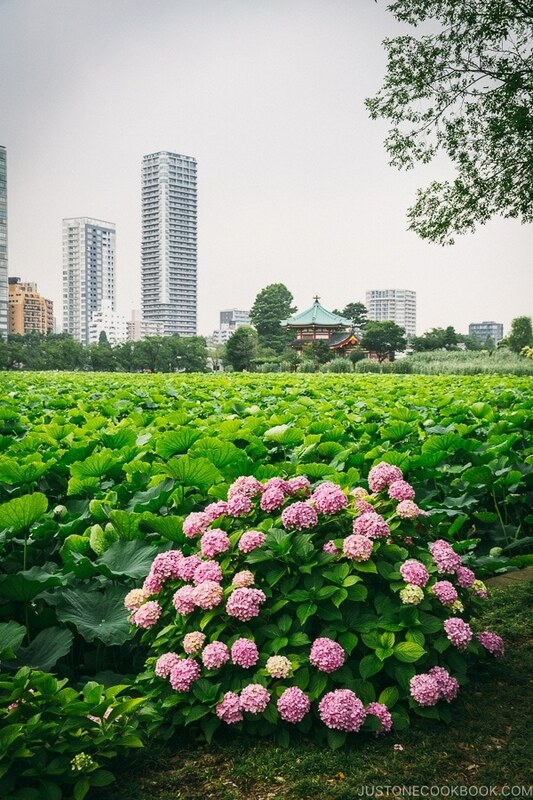 Bus 12 and 14 will take you to Heijo Palace Site. You can also take the taxi to get around the city and the standard pricing to each location are listed for visitors on the taxi stand sign. Alternatively, you can use Gurutto Bus to get around Nara. Each ride is 100 yen or you can purchase a day pass for 500 yen. There are Gurutto Bus stops near many of the popular locations. 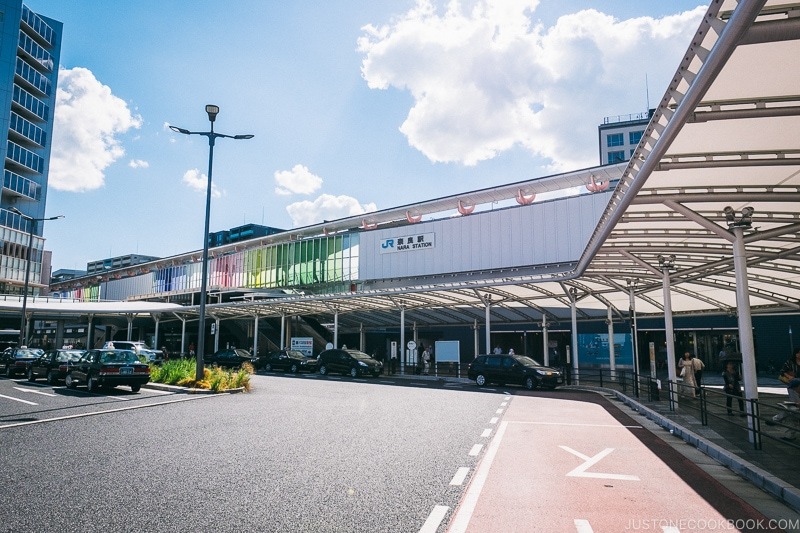 If you forget something or get hungry, JR Nara Station has you covered with plenty of restaurant choices and stores to purchase goods. 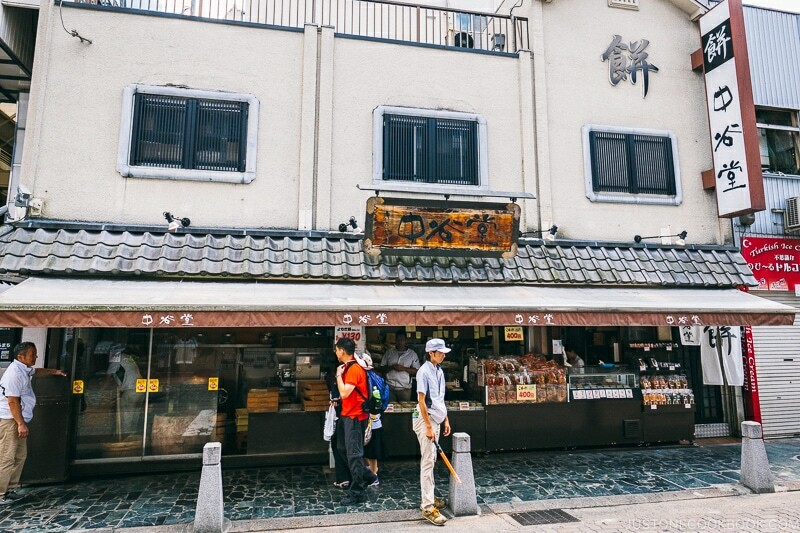 Naramachi was Nara’s historic merchant district and it is one of the main attractions for visitors to the city. 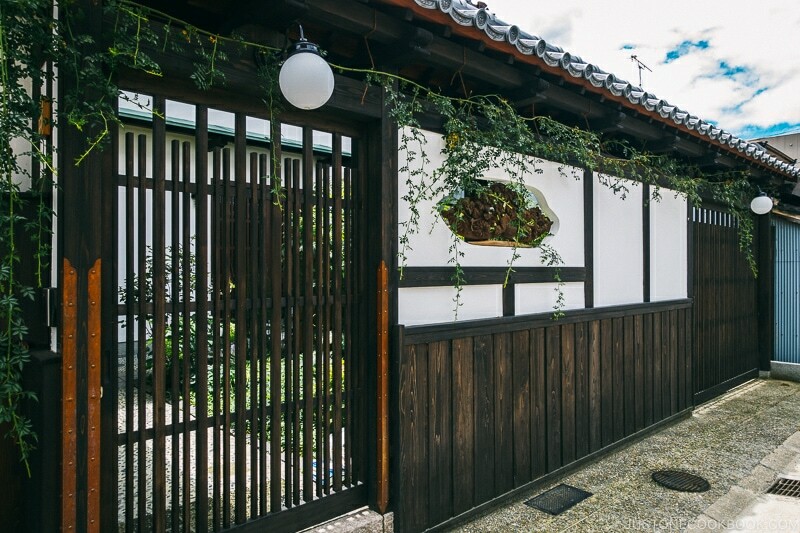 There are well-preserved wooden machiya in this area that has kept their traditional look. 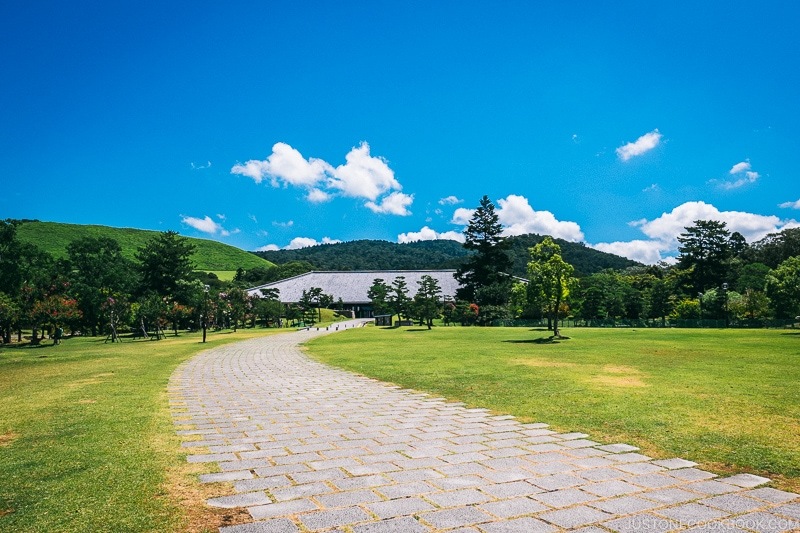 In Naramachi district, we recommend the Naramachi Museum (奈良町資料館) and Koshinoie (ならまち格子の家) where visitors can go for free. 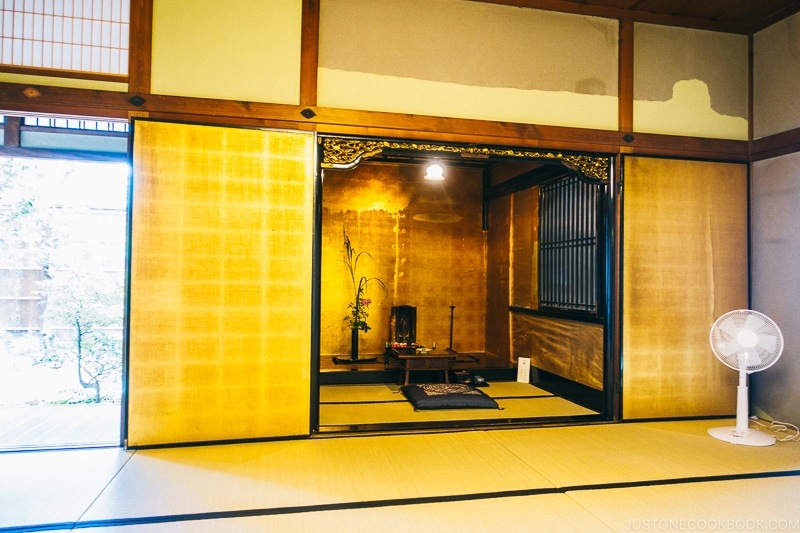 Koshinoie is a very well preserved machiya. You are able to explore the house from the inside and understand what it was like to live in a traditional townhouse. Besides the well-preserved machiya, Japan’s oldest Buddhist temple Gangoji is also in Naramachi. 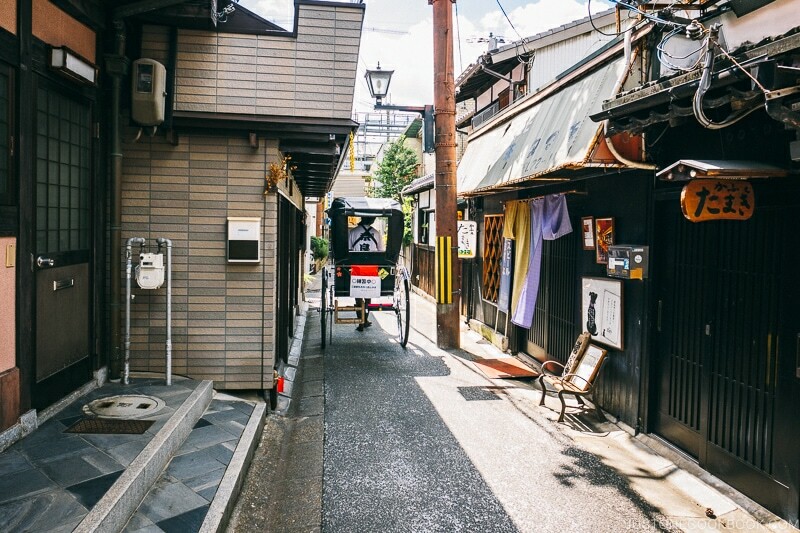 Just a bit north of Naramachi are many small streets and shops you can explore. 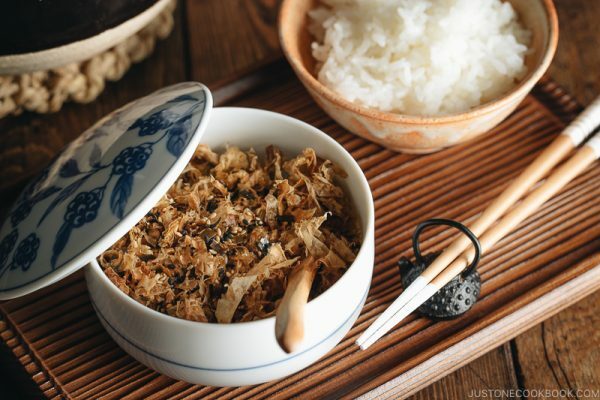 There are a few restaurants that sell Nara specialty – kakinoha-zushi (柿の葉寿司). 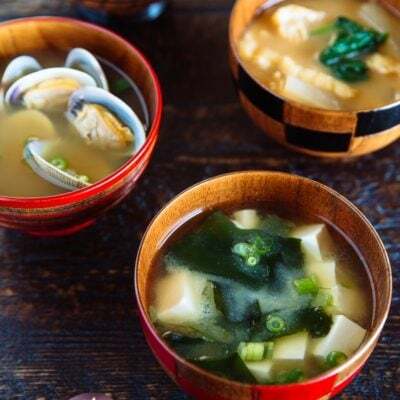 What is kakinoha-zushi? It’s sushi wrapped in permission leaves. 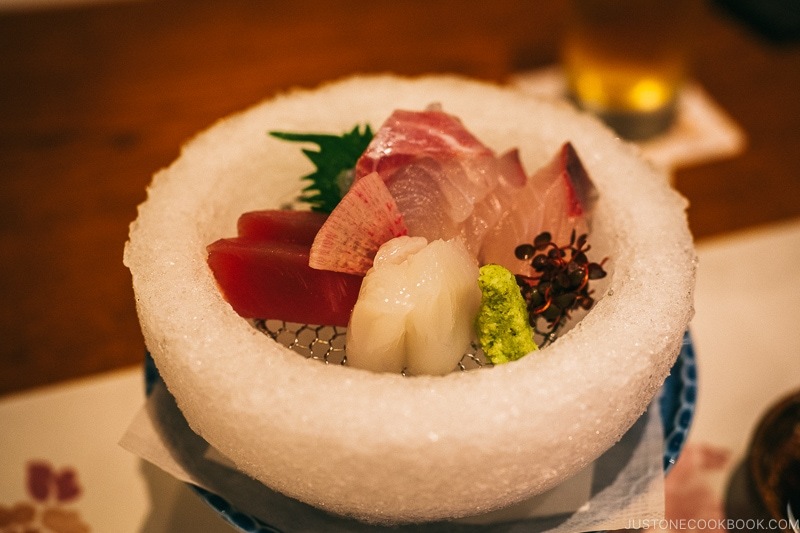 Since Nara is located inland it was difficult to transport seafood safely before refrigeration. 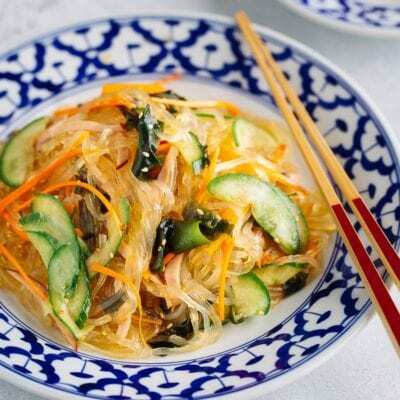 Persimmon leaves had antibacterial properties and could keep the sushi fresh by wrapping inside the leaves. 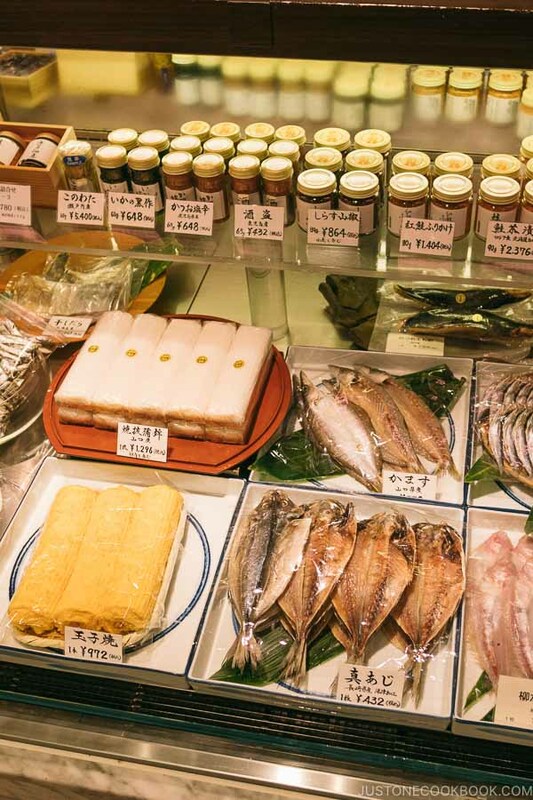 Unlike typical sushi restaurants, there aren’t many varieties of fish to pick from. 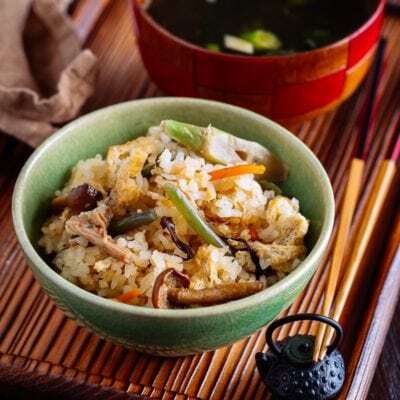 Kakinoha-zushi is usually served with salmon, mackerel, and trout. 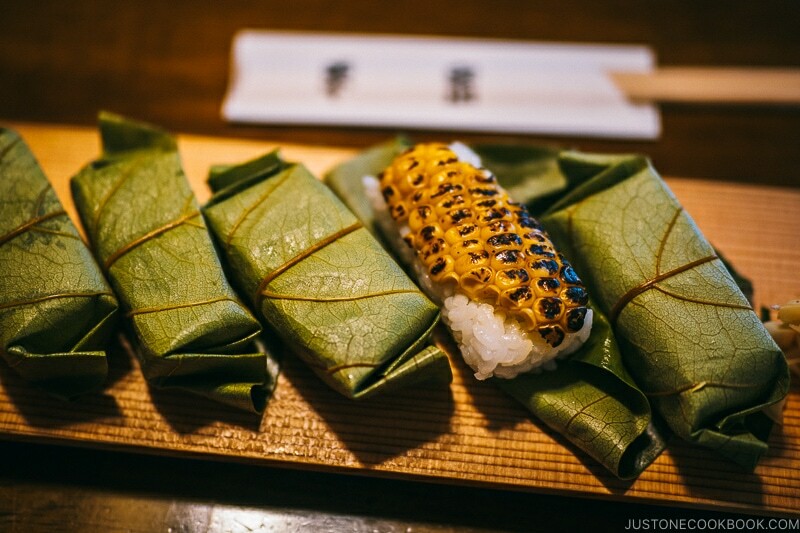 With our set meal at Hirasou, it came with assorted sushi including grilled corn, and green tea rice was served on the side. 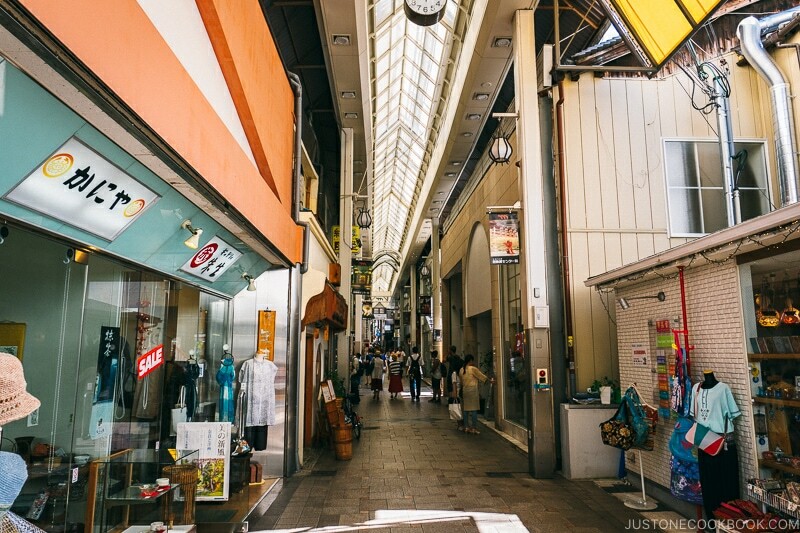 Continuing walking just a bit north you’ll find the covered shopping arcade Mochiidono Center Gai. 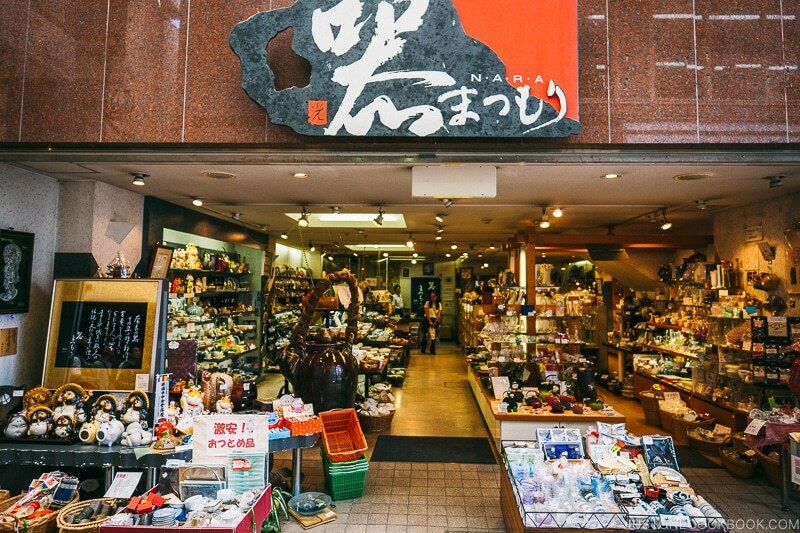 You can find all sorts of Japanese souvenirs on this street along with many restaurants. What drew us there was the popular mochi making shop Nakatanidou. 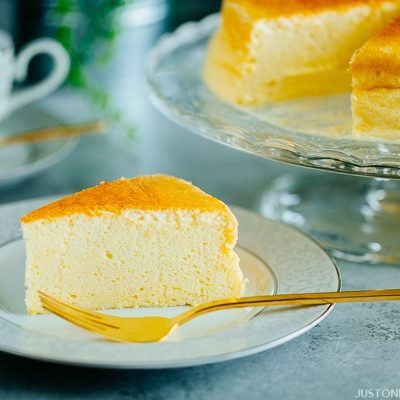 Nakatanidou has been making headlines with its rapid pounding and kneading of mochi and you can check out how they do it in the clip below. 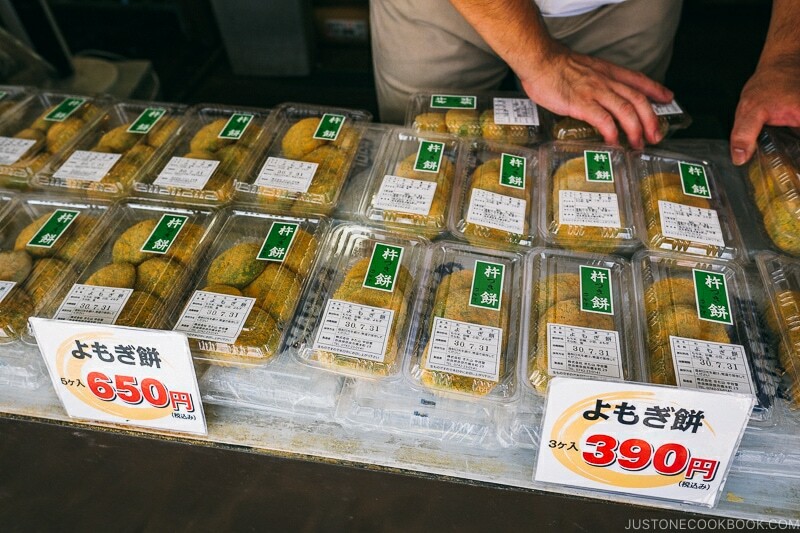 The mochi shop do not have a set time when they perform, and our suspicion is that the shows are put on when a tourist bus stops there to buy mochi. Regardless, their yomogi mochi was super delicious. 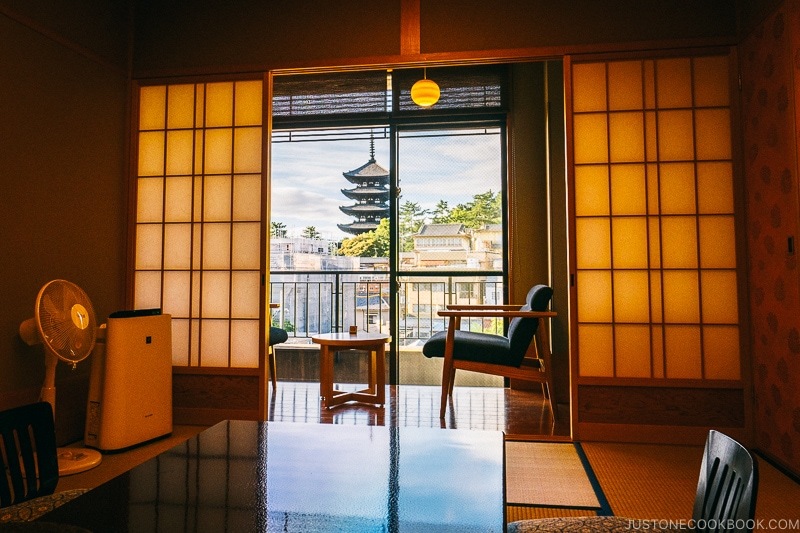 We recommend spending at least one night when visiting Nara. 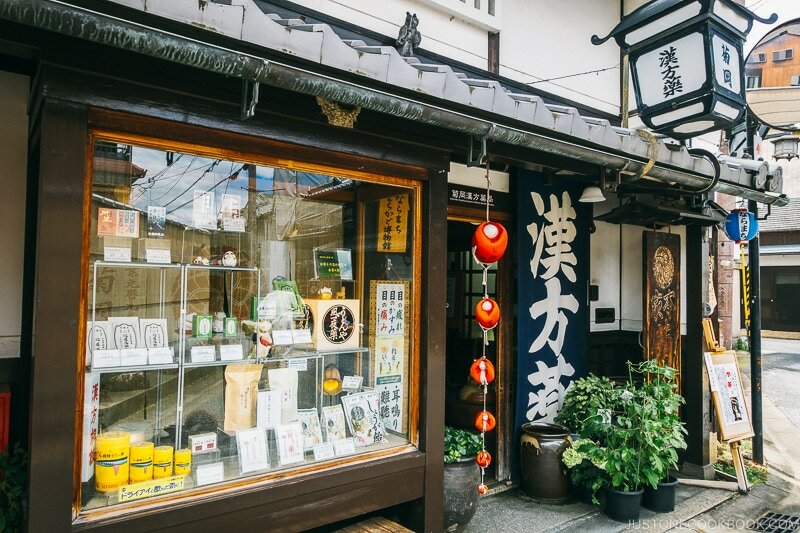 You can easily do a day trip from Kyoto but relax, slow down, and enjoy many attractions the city has to offer. 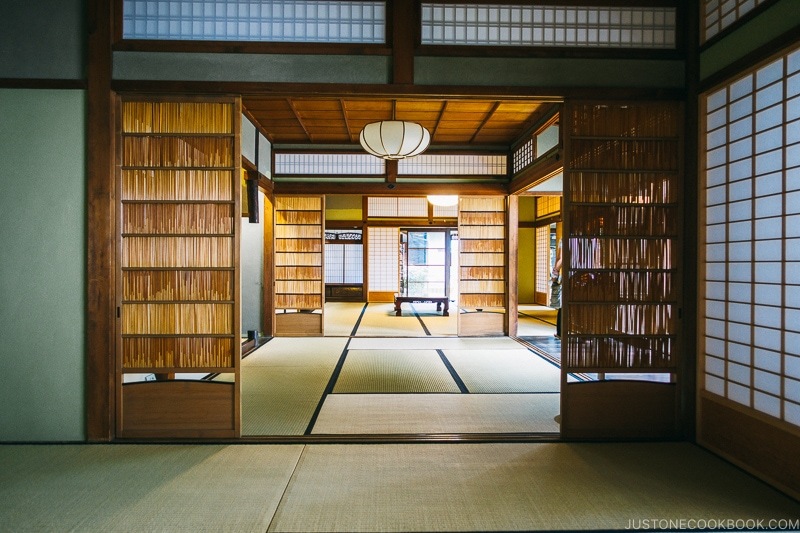 On our two trips there over the years, we’ve stayed at a ryokan and also one time at the historic Nara hotel. 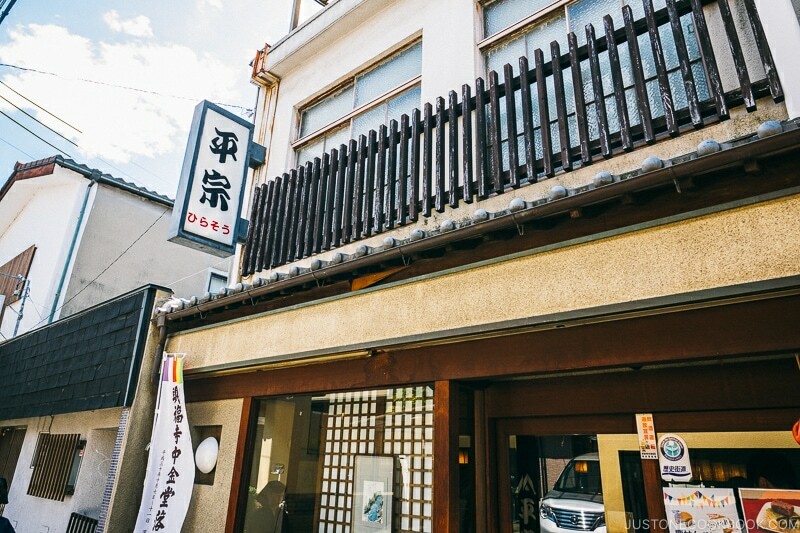 The ryokan we stayed at was Asukasou Ryokan and we really enjoyed our stay there. 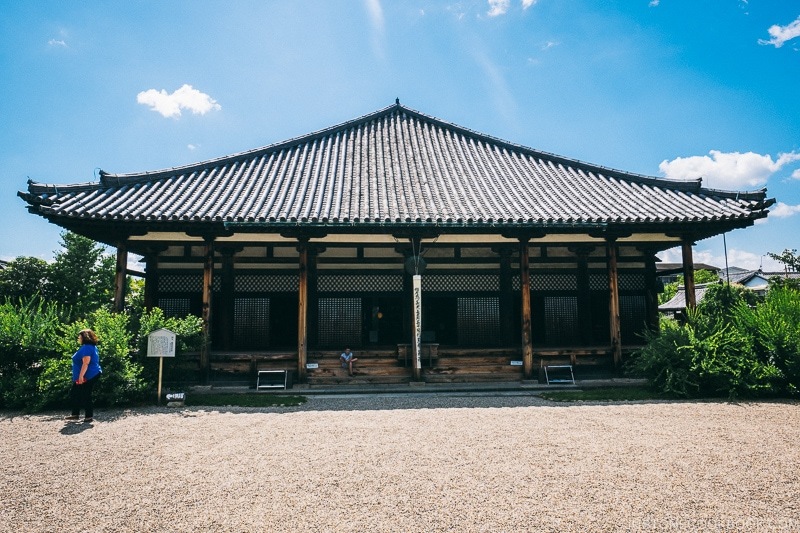 Its location is very convenient and you can walk to many of the popular attractions in Nara including Kofukuji and Nara National Museum. 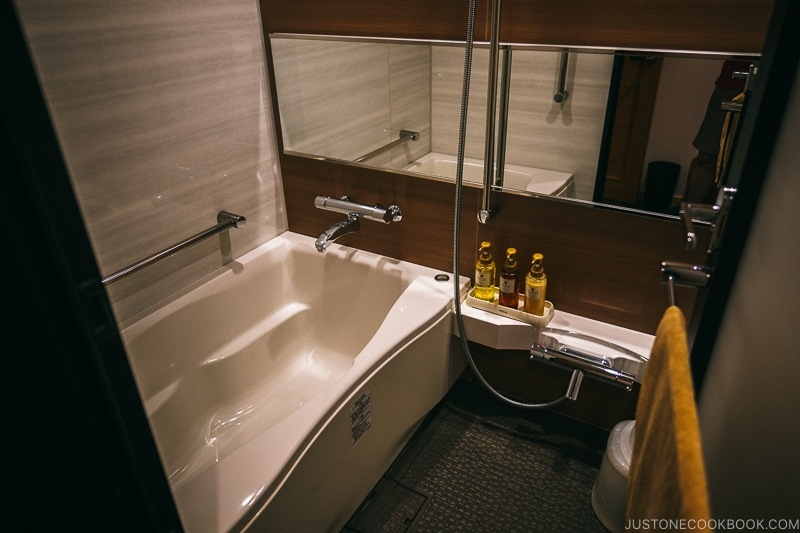 The bathroom at Asukasou Ryokan are updated and very clean and modern. 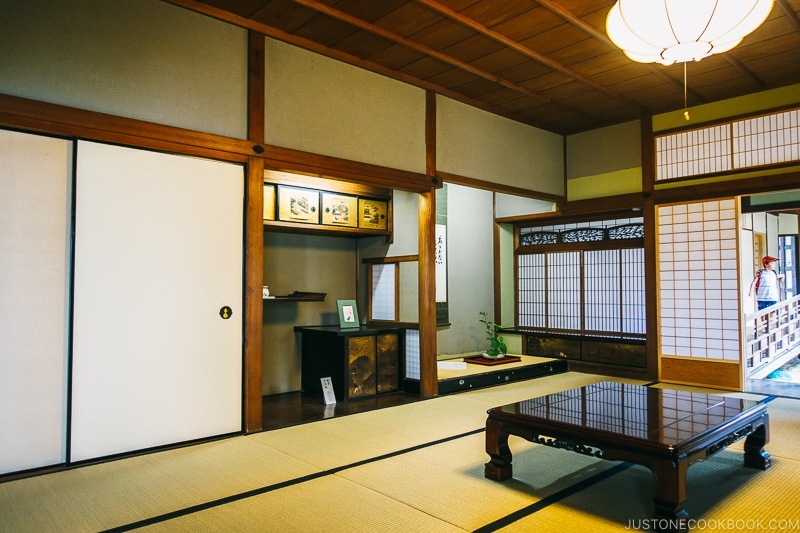 During a ryokan stay, while you’re eating dinner the staff will transform the room for sleeping by laying out the ofuton. 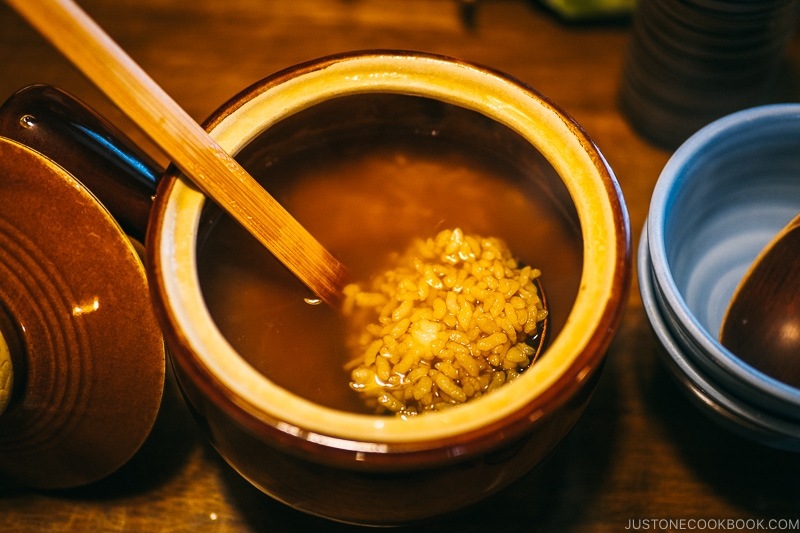 There are 5 main criteria for evaluating a Japanese ryokan, it’s service, facility, dinner, onsen (hot spring), and breakfast. 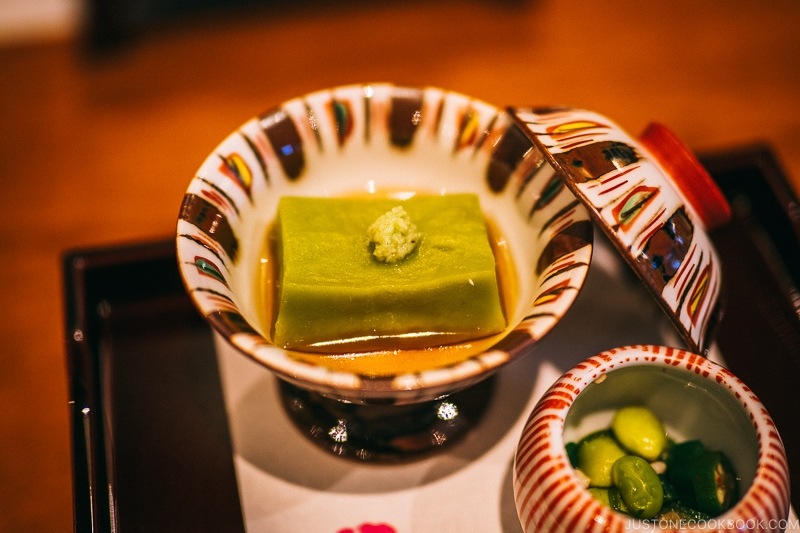 Asukasou Ryokan had great service and the staff paid attention to small details. 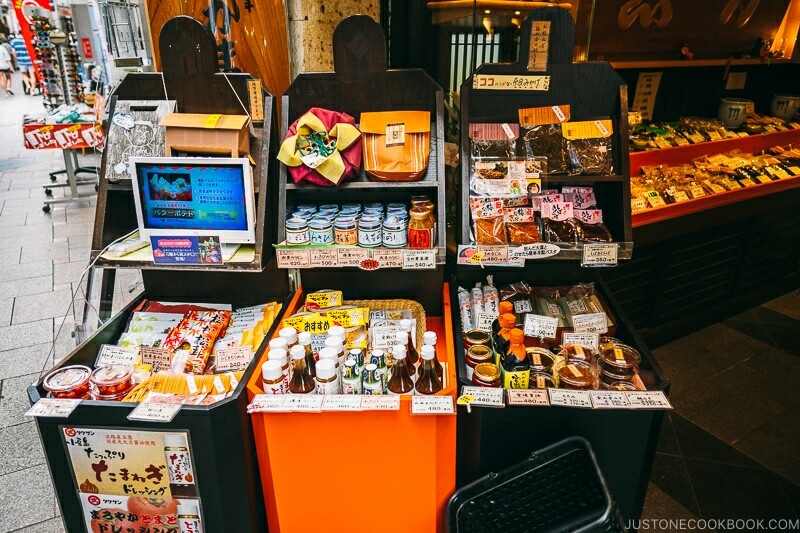 When we first checked in, they had a tray of traditional Japanese candies where children can pick and select what they wanted which made them really happy. 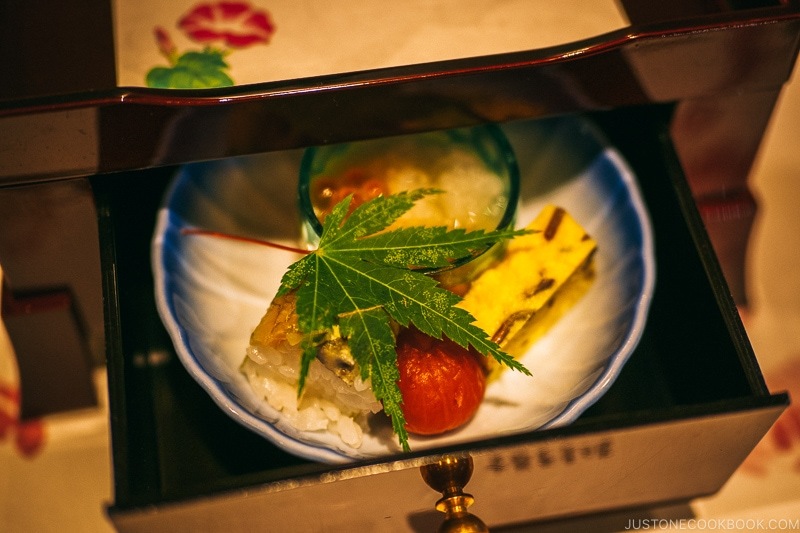 The dinner was standard kaiseki where the chef showcased local seasonal ingredients. The meal was delicious and the dishes were delicate. 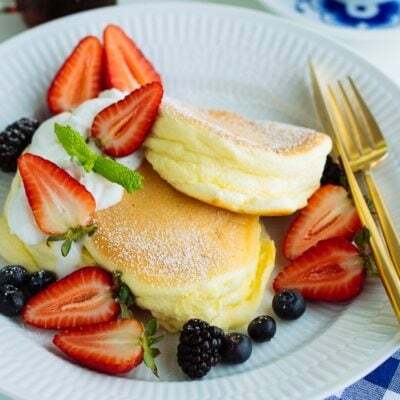 The breakfast was also very tasty and well prepapred. 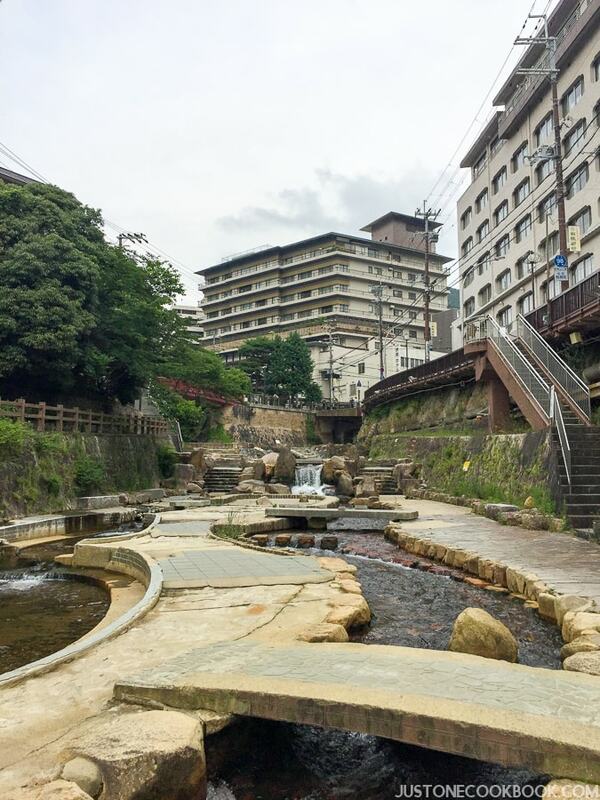 The only downside of the ryokan was it’s very small onsen area. It was on top of the building so the view was good, but there was only one small soaking tub. 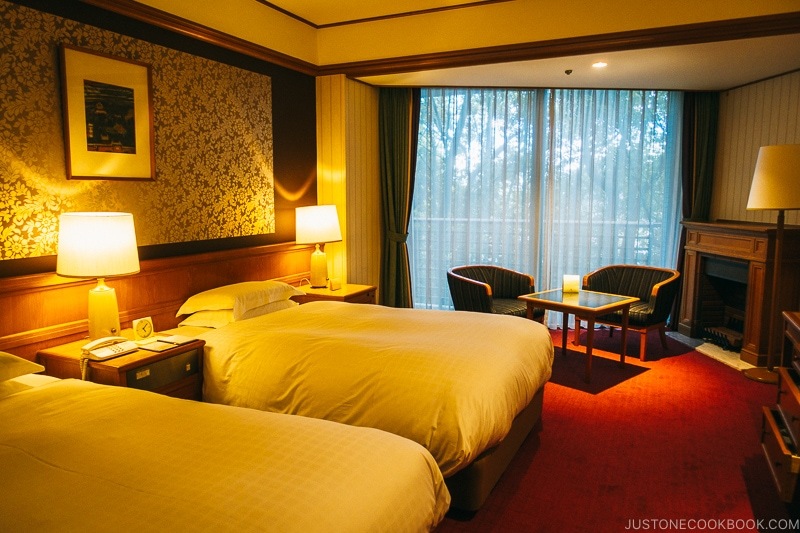 If you want to experience a hotel with a rich story in Nara, look no further than Nara Hotel. 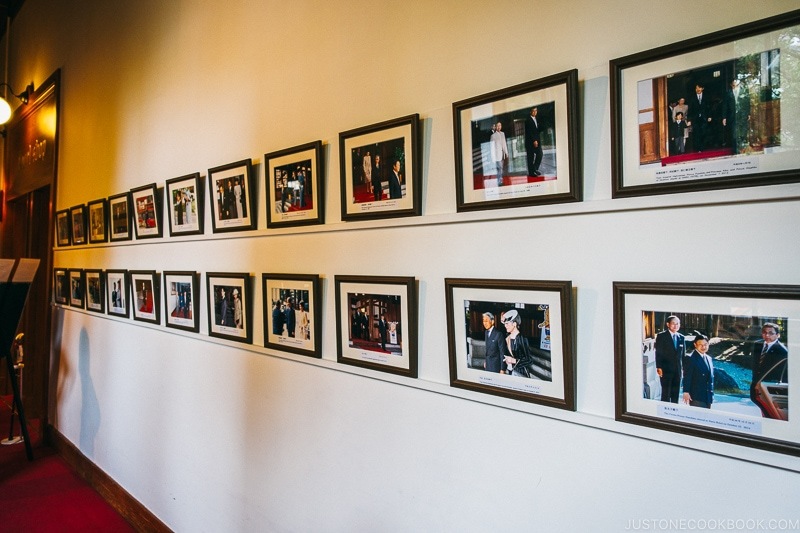 With over 100 years of history, Nara Hotel is the choice for emperors, presidents, and many celebrities to the city. 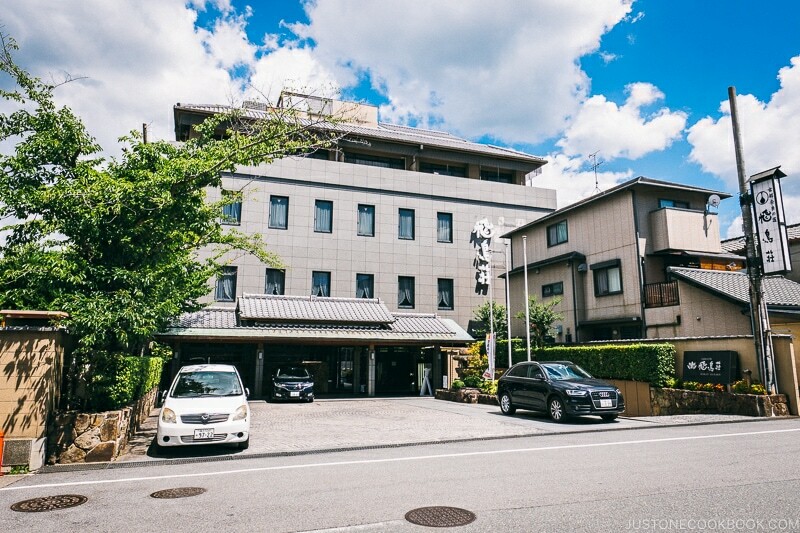 Nara Hotel is conveniently located in Nara Park and closed to many sightseeing spots. 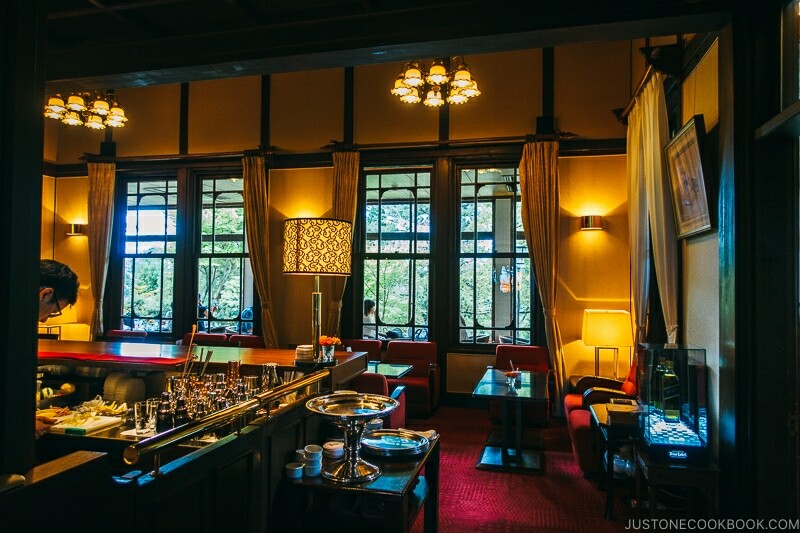 The interior of Nara Hotel is traditional design and it has kept its classic look. 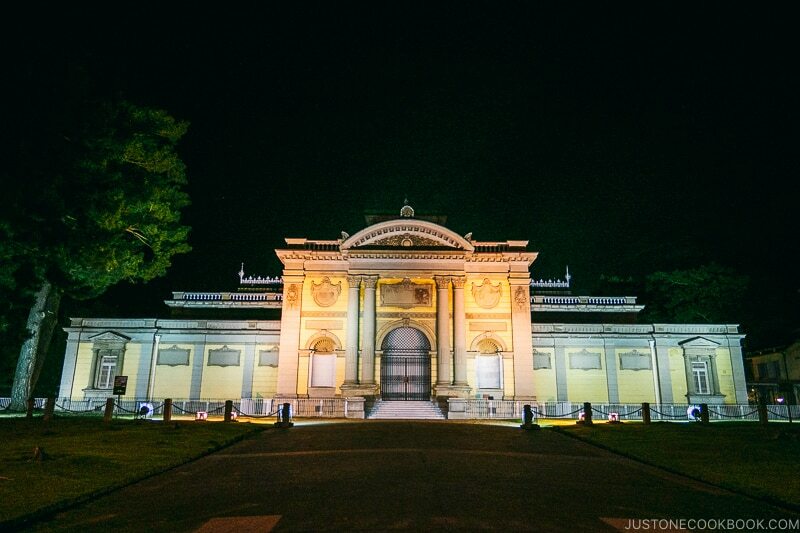 Not far from the Nara Hotel is Nara National Museum. 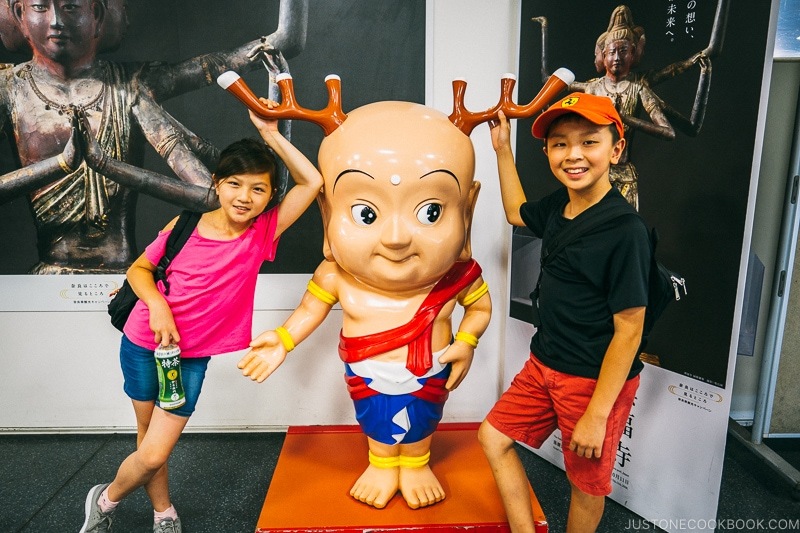 The museum has an amazing collection of historic Buddhist sculptures, paintings, and statues. 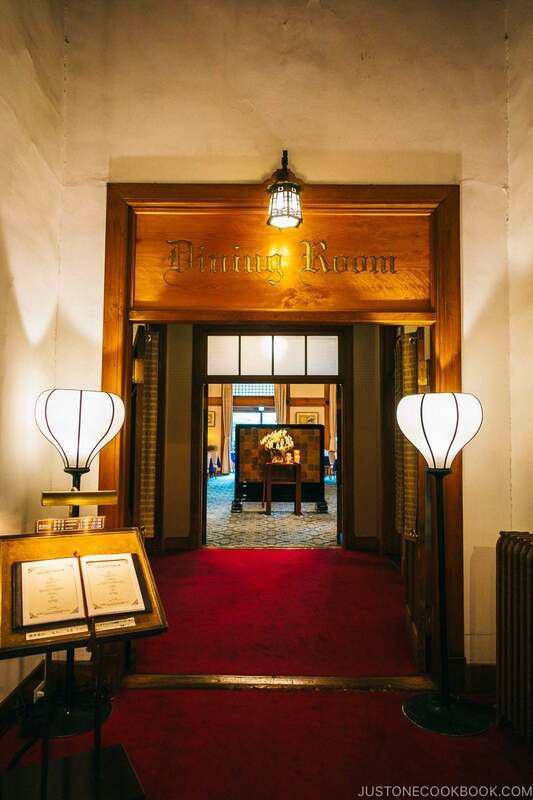 The museum’s history goes back to 1889 and there are many priceless national treasures in their collection. Lastly, when you’re going between Todaiji and Kasuga Taisha, you’ll cross the beautiful Nara Park. 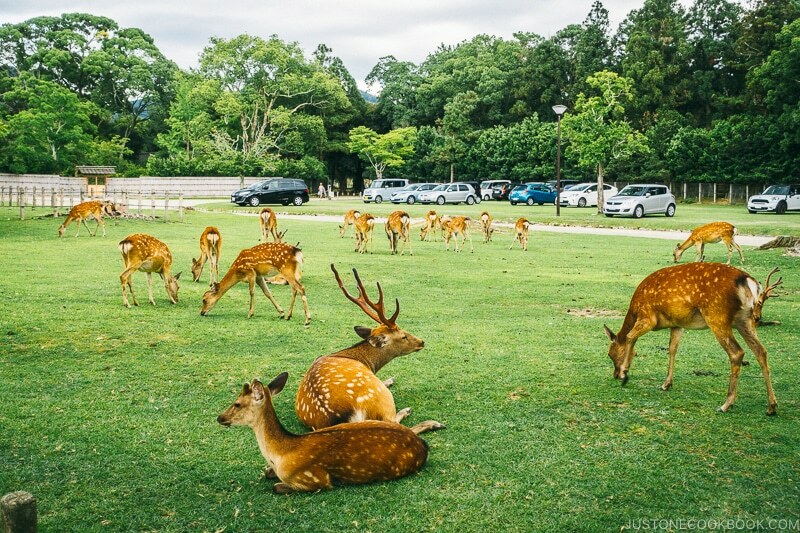 Nara park has hundreds of wild deers roaming around freely. 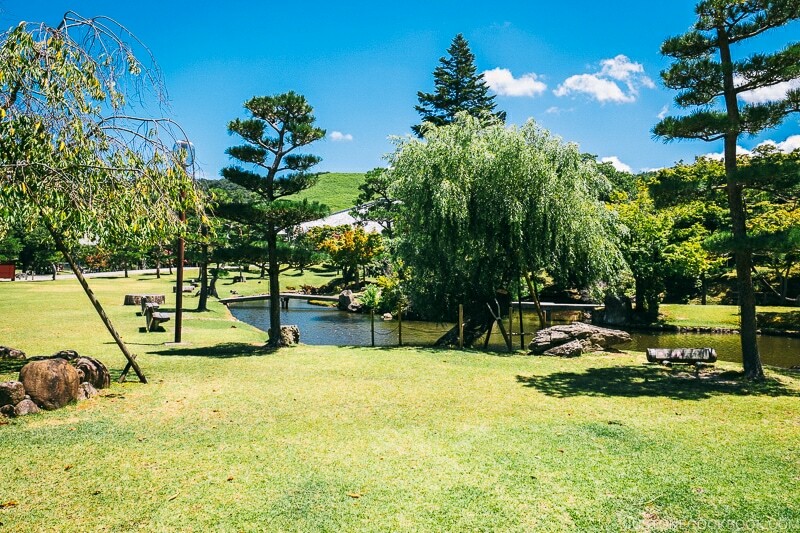 The park is very large and has many locations with beautiful scenery. You can buy shika senbei to feed the deer but please do not tease them and treat them with respect. Also, watch out while feeding as the deer could be aggressive if you have food. 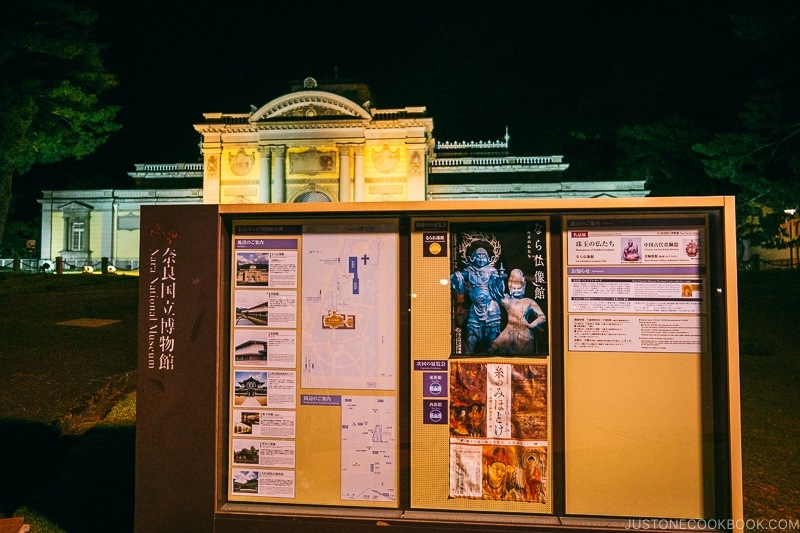 We hope you enjoyed our travel guides on Nara. 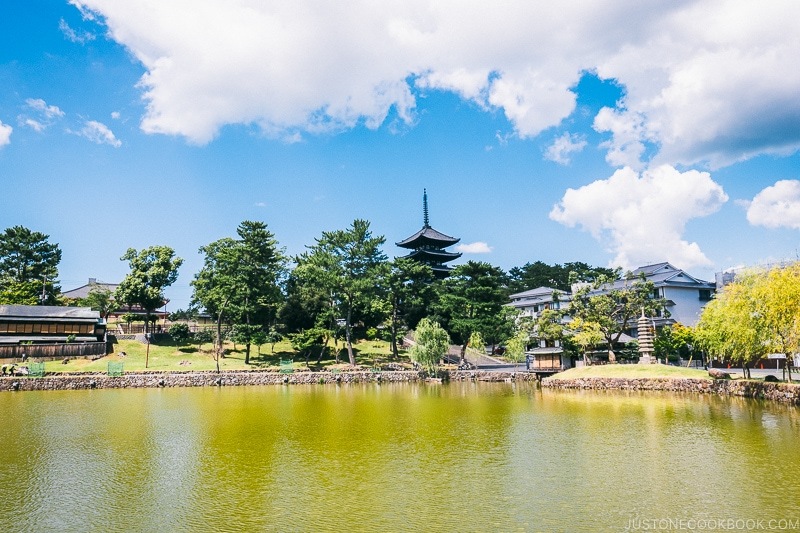 We had a fantastic two days there, visiting centuries-old temples and shrines, exploring new food like kakinoha-zushi, and taking in the peaceful and calm sceneries at Nara Park. If you have limited time, do not skip Todaiji, Kasuga Taisha, and Kofukuji. 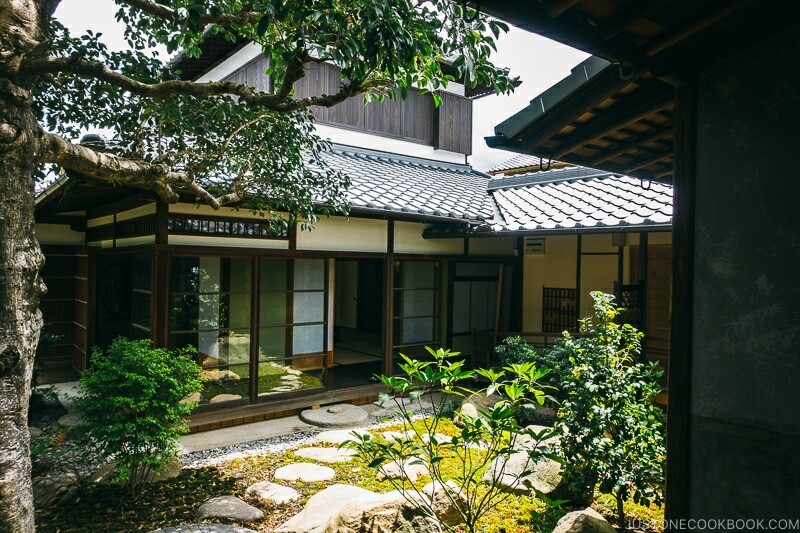 We highly recommend spending one night and experience Japanese hospitality at a ryokan or Nara Hotel. 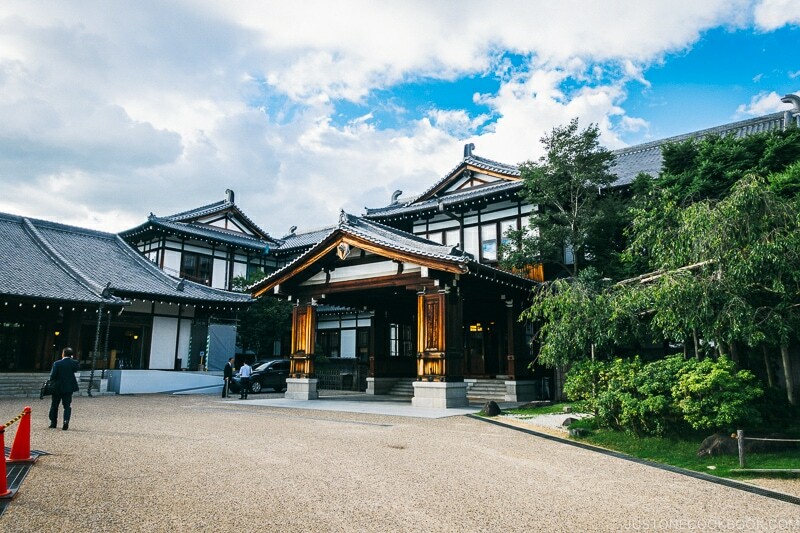 Stroll through Naramachi and see the well-preserved machiya, and check out the priceless treasures at Nara National Museum. Thank you for traveling with us and if you want to check out our adventures throughout Japan, check out our Japan travel guides. I just love all of the pictures and stories you tell us about Japan. I hope to travel there one day.I was born in Japan but have never have been back after leaving as a baby. What amazes me is how clean everything & everywhere seems to look. The food probably speaks for itself I bet. 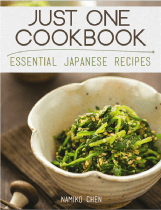 You have such fabulous Japanese recipes & I truly enjoy them all so thank you. Thank you for reading our travel posts. Japan is one of the cleanest if not the cleanest country I’ve been to. All the public facility are well maintained and you hardly see any garbage on the streets. If you want to travel to Japan, go during the low season when it’s less crowded and the additional benefit is cheaper airfare and hotels (avoid summers). 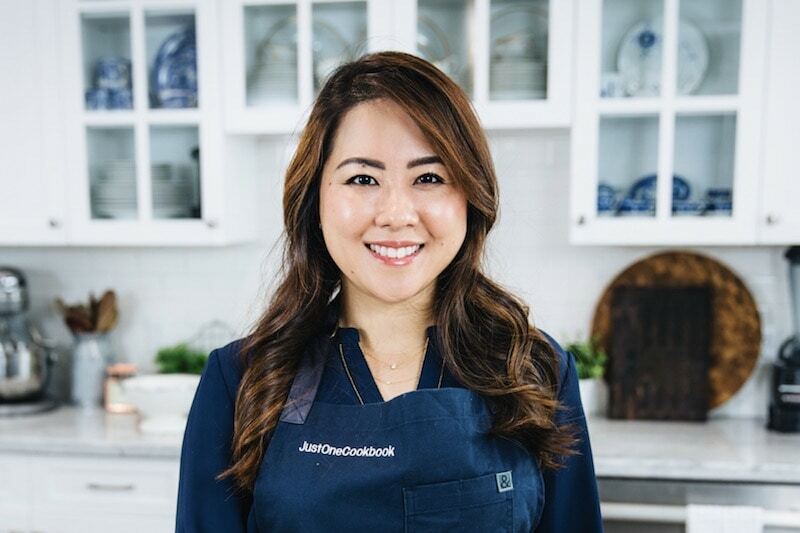 I LOVE your website and look forward to all of your posts. I especially admired your trip to Japan and the fascinating pictures and explanations of the beautiful historical places. I will revisit them to read more intensely. Glad that you and your family are able to visit so many places! Your children are adorable (your daughter looks like a mini fashionista). 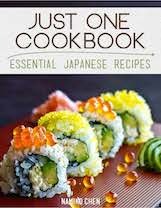 Also, I keep learning so much from your blog and save the recipes (I love sushi, BTW). 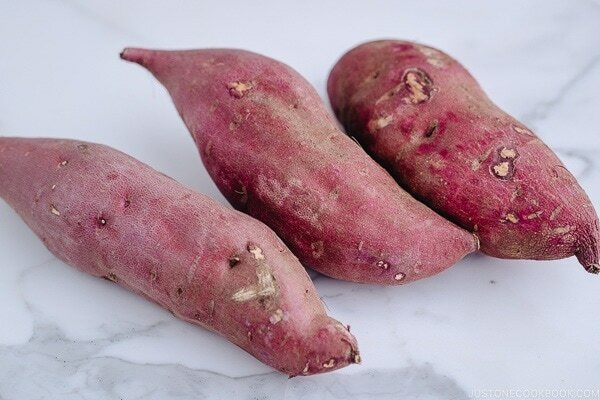 Congrats on the new addition to your family. Have a wonderful week end! Thank you for reading our travel posts and we’re so glad you enjoy them. 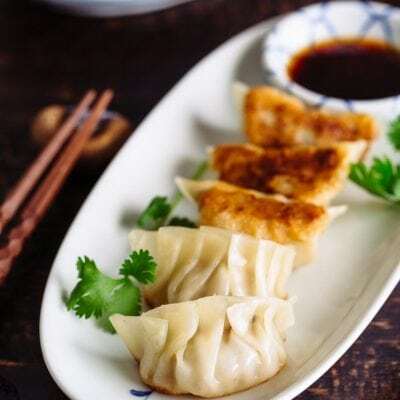 We write them to give our readers the best tips so you’ll have the best experience when you visit based on what we learned. 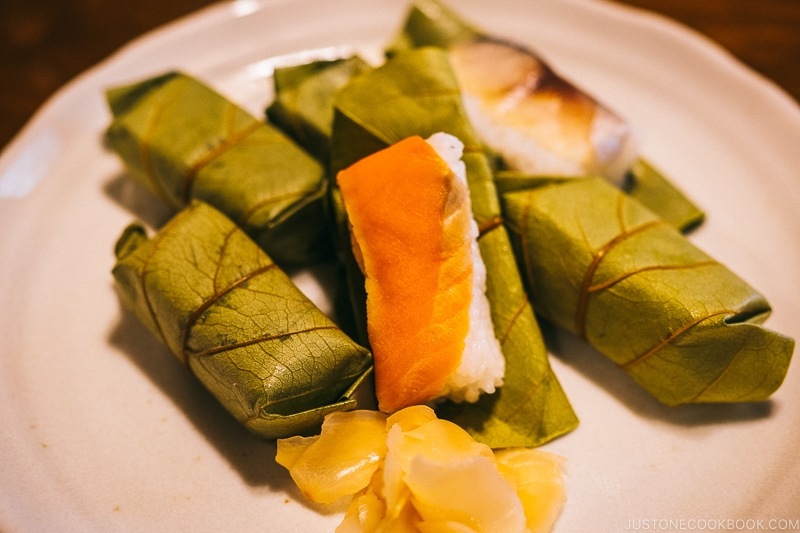 Since love you sushi, consider making temaki (https://www.justonecookbook.com/temaki-sushi-hand-roll/) at home if you haven’t tried. 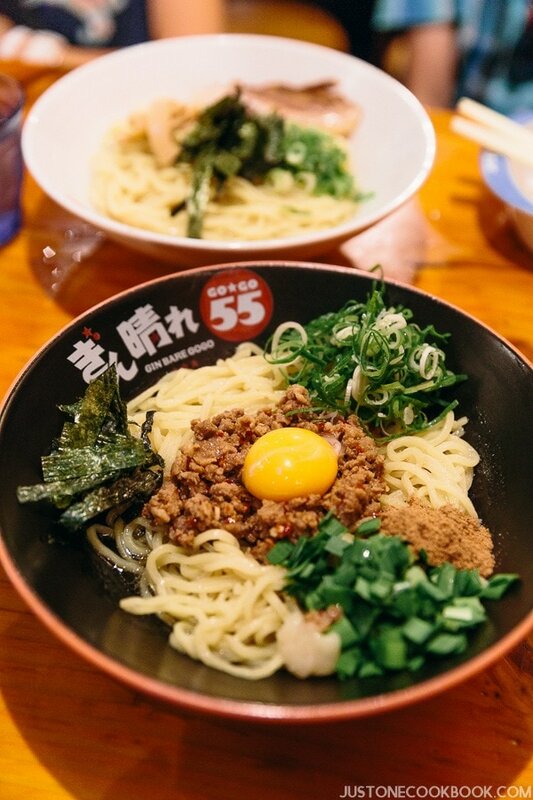 It’s our family’s weekly ritural and much cheaper option than eating in Japanese restaurants. How about going to nara from osaka? What transportation is the best with young kids like yours? It’s very easy to get to Nara from Osaka. 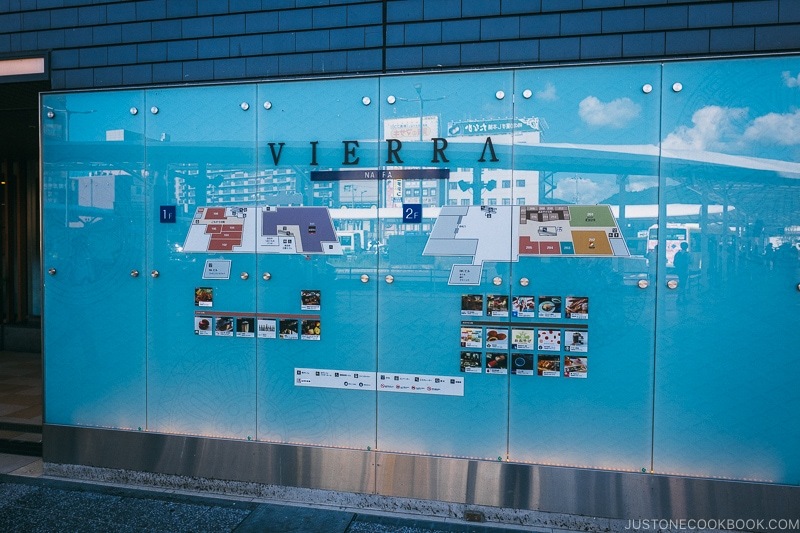 You can take the Kintetsu-Nara Line from Namba Station to Nara Station. 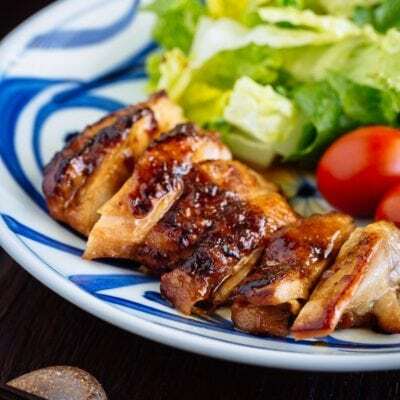 The cost is 560 yen per person and takes about 1 hour. Alternatively you can also take the Osaka loop line from Shin-Imamiya Station to Nara Station. It’s the same cost but slightly faster at 35 min for the trip.